Before arriving in Paris to study this semester, my friend Alisa and I booked a detour of several days to Marseille, in the south of France. She kept prattling on about how we were going to take a trip to the Calanques during our stay, and I just nodded and smiled without the faintest clue of what they were. That's how I approached the whole trip to Marseille, really, but more to come on that. 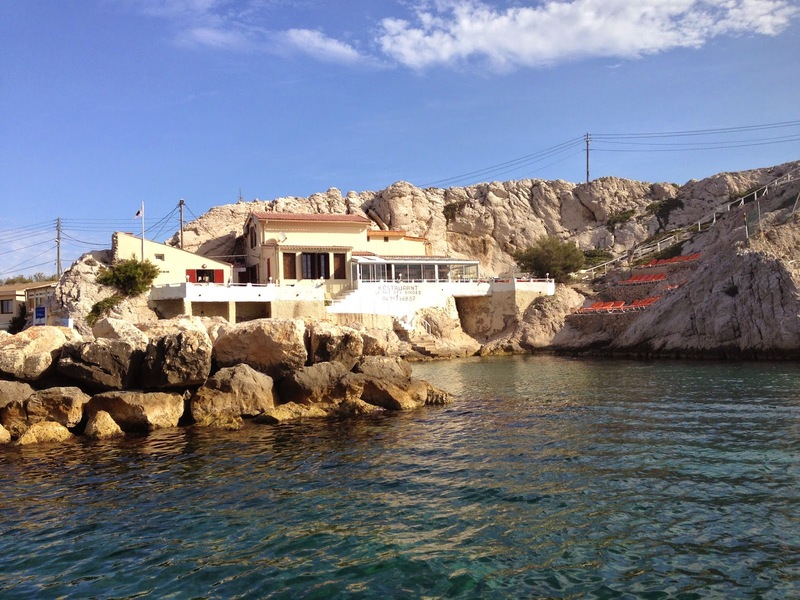 Turns out, they are a 20-km stretch between Marseille and Cassis of huge chunks (otherwise known as "mountains," "cliffs," or even "fjords") of white limestone that rise up from the deep blue or crazy-bright turquoise water of the Mediterranean. The best way to see them is by boat, and we booked a trip of a few hours through Bleu Evasion. I am uneducated about boats, but I believe we might have been on a speedboat? It was small (there were 8 of us, and no one else spoke English) and we went fast. That's all I know. I only followed about 40% of the guide's rapid-paced French, but I'll choose to believe that he said this restaurant is only accessible by boat. He definitely said that its name, "Restaurant of the Bay of Monkeys," is a reference to the mafia's omerta - see nothing, say nothing, hear nothing. We also dropped anchor to snorkel for a bit. The water was cold enough that before jumping off the boat, I counted down and swore in Russian. When I surfaced, I swore in English. I saw a few bewildered faces and I was like..."hmm, do these people speak Russian?!" but Alisa reminded me that 'holy f***ing hell' is a relatively universal phrase. Trust me. It was cold enough to justify much more. We passed close to many small beaches replete with nudists, grottos where teenage boys dived into the water, and tiny inflatable boats (someone educate me about boats) on which people passed around beer and bread. What a weekend hang-out spot, man. The last one is a shot that a fabulous lady from Avignon took of me and Alisa swimming into a cave about 25 metres wide. She must have gotten naked to change outfits on the boat at least once per hour and had to be reminded to take off her pearls before getting in the water. The website states that the trip is one-way from Marseille to Cassis, but we found ourselves racing back towards blackening storm clouds and lightning in the direction of Marseille. On the one hand, it was amazing not to have to pay for or take the bus back, but on the other, we ended up walking back home in the exact 15 minutes that it was pouring rain harder than I'd ever seen. We just figured that we were already soaked and freezing, so c'est la vie. I hope we brought some joy to the horrified French people watching us tromp up the street from underneath the shelter of café umbrellas. Turns out putting the Type-A instincts on hold for a second and following your travel partner blindly can work out beautifully, sometimes...Sometimes. I'm not ready to stop planning yet.